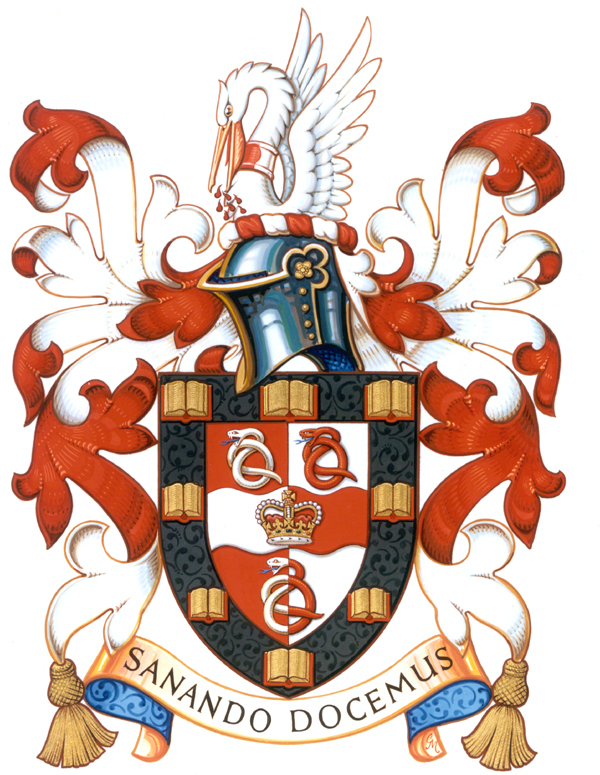 On the occasion of our 25th anniversary in 1965, the College of Arms of London granted and assigned our own proper armorial bearings with the official motto of “Sanando docemus” (“In healing, we teach”). Her Majesty the Queen Elizabeth II approved the inclusion of the Royal Crown in the armorial bearings in 1970, which were assigned by the letters patent under the signature and seal of the Garter King of Arms on June 1, 1971. The Faculty is only one of three faculties of medicine in Canada with its own coat of arms, designed by our second dean, Dr. Jean-Jacques Lussier. In legend, the pelican tears the flesh from its own breast to feed its young. As a symbol, the pelican expresses the compassion essential to the practice of medicine. The colours, red and silver, are Canada’s traditional colours and represent the country’s two main languages and culture. The wavy fess represents the Ottawa River. The Royal Crown signifies Queen Victoria’s choice of Ottawa as the nation’s capital. The snakes twisted around the staff of the Aesculapius have long been the symbol of the medical profession. The symbol reflects an ancient belief that snakes possess healing powers. The three snakes in the shield represent the Faculty’s educational programs: Undergraduate Medical Education, Postgraduate Medical Education, as well as Graduate and Postdoctoral Studies. The golden books, a heraldic symbol of educational institutions, represent the light of science and knowledge breaking through the darkness of ignorance and fear signified by the black border.